Photograph by Allison GaskinsThere’s a tree house in our backyard. It’s the realm of small boys. There’s a ladder, rope for pulling treasure up, and an unsafe swing rigged from chains and scrap wood. Inside are the partially dissected remains of a squirrel along with sticks, collected rocks, and hidden pocket knives. I don’t venture often into this lair. It’s probably better that way. I would cramp the freedom of the fellas and, no doubt, find things to worry over. This is the place of boyhood, where adventures are imagined and sometimes acted out, from which vantage point the neighborhood is a landscape to be observed by plastic binoculars. If one climbs to the rooftop, it’s a pirate ship and standing on the bow you can face the horizon for miles or at least see over the fence into the neighbor’s yard. I had a tree house of my own once, and if it’s true that we are most fully ourselves when we are eight years old, that tree house held my wildest dreams. I hoisted a basket up every day after the yellow bus dropped me home from school — a basket full of American cheese slices, colored pencils, paper, and books. I pulled the trapdoor shut to keep out the siblings and dreamed and read and created until dinner. I’m still dreaming and reading and creating, and occasionally closing doors to keep people out. Now, on days when the panic swells and everything in me struggles to flee, I want to shimmy back up that childhood tree. I can’t — strangers live in that house now — but I do find myself drawn to it. Sometimes I walk by the old place, craning my neck to see that leafy wooden castle out back. When my heart wants to be little again, my other fantasy is to get in the car and drive, either due west or due south, to one of the havens of my childhood. There are places in my history where I came to know myself in real ways. There is land that reminds me who made me. There are hills that sing to me of who my people are, and there’s a road where I ran until I understood the girl that God had created within this lanky frame. These are the places that made me, and when the earth is shifting at home, or when I just forget the truth, these are the places I crave. Some places are meaningful because of the people we share them with. Others are hallowed because they belong only to us and God. Where does one go to clear the noise and let the dust settle in the mind? A few miles from here in the heart of downtown sits a small Catholic church. It’s dark and cool inside when noon beats hot out on the street. The air breathes history and peace. This is the place where my friend Ella walks to eat lunch every day. When her inner voices are hollering and the pulse of the city beats too hard, this is the still point in the madness. She draws peace here. There is serenity in the shadows. The air is laced with incense and history, but it’s not Ella’s own history. It’s nothing like her past, in fact, but it has become her present. In this sanctuary, she is a stranger to everyone but her own self, and that freedom is erasing the expectations that once bound her. Ella tells me, “So many important spaces in my life are significant or sentimental because I have been there with people I love. St. Stephen’s is different. No one walked in with me that first time I happened upon it. Even though no memories of this place involve my loved ones, it feels like home. I breathe a sigh of relief walking in and the familiarity of the smells and the structure itself give me comfort. I speak only to the Lord and my thoughts are stayed on Him when I walk in.” Somewhere inside her grows a space of sacred stillness. Its contours are that of St. Stephen, but its skin is her very own. I happened to drive by this church last week and I saluted it but didn’t stop to look closely or walk inside. It belongs to Ella, and I don’t want to dilute its power in her life by sharing it. Once, a friend brought me a nosegay of lilies of the valley. I set this posey in my kitchen window and walked away. By the time I returned to wash the dishes the air was ripe with scent from tiny white bells. Immediately, I became five years old in our Pennsylvania garden, young and happy and playing outside in my nightgown. I have no specific memories of such a moment, but standing there at the sink I was transported by the scent to a place I’d nearly forgotten, a shady corner near a stone wall, where lily of the valley grew in abundance. I called my father to be sure, and he confirmed my new remembering, that lilies grew everywhere around that old white house. He misses their fragrance, and now that I remember, so do I. That garden shaped my innocence and joy and it echoed with the laughter of trustworthy parents. Now I’ve planted lily of the valley outside my own kitchen so I can see it and recall and clip the blooming bells for my window. When I breathe with the lilies, I am a trustworthy parent who laughs like a child. This house I live in feels like home. We’ve lived here ten years, longer than anywhere in my adult life. I love this place, these walls that give our family shelter and house our memories. I pray this will be a space that shapes our children in meaningful ways. But for me, it’s not. It’s a familiar expression of who I am, who we are as a family, but it has not made me the way other places have. This home where I lay my head next to a good man, where children sleep down the hall, this address that is on my letters, it is a kind place. I am grateful for this roof and this safety and this comfort. But on some days, I find it hard to remember who I am inside these walls and fences. I think this is because here, I am so many people. I am mother to the nearly grown, and to the ones still wiggling loose teeth. I am temporary mother to those who share our home for days or months. I am the wife of a patient man who tries to hold me close even when anxiety fights in me and I can’t be still enough to be held. I am the trembling patient in the doctor’s office, and the teacher of Sunday school, the chauffeur and the cook, the worker and the boss. These titles tell me what I do, and these roles, though sometimes so very difficult, are good. But these are not the fullness of me. This is not the sum of who I am. And to remember who I am, I return to the places that shaped me. On the nights when I can’t sleep for the loud pounding of my heart, I try to take myself to these other horizons in my mind. My shaping places are seldom buildings. They are more often curves of the earth, and sounds of God breathing in the near distance. When I hear southern cicadas hum, adult responsibility falls away and I can dance like a child. When cool air laced with hemlock and cedar fills my lungs, I am thirty-something, finally awakening to the things I truly love; things as simple as the music of words and the color of fresh vegetables. This summer, I’ve had the good fortune to visit the places that have shaped me the most in my life. I didn’t realize how much I needed this returning until my feet touched sandy soil and Spanish moss draped our car. South Carolina’s lowlands tell me where and whom I come from. When the car points south and we hit the highway before dawn, I am giddy with anticipation. I know that the road “home” to my roots will take me to places in myself that I’ve forgotten existed. Indeed, I do feel taller. 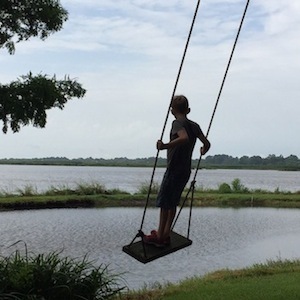 Later, the cicadas sing me a love song as I push my son on a swing over the low country waters. He arcs over the surface of my own childhood and pleads, “Higher!” While I push, I think, “Deeper.” He swings out over history and honest faith, over slavery and freedom, over tomatoes and forgiveness, over the memory of my grandmother’s voice saying my name with love. This place, where the air is so heavy and damp I wear it like a familiar garment, dresses me in assurances. I am loved. I was born to a family that loved me before they knew me. They will always love me just because I’m one of them. I’m hemmed in, but with freedom. Weeks later, we organize our travel so that we can spend one night in the Laurel Highlands of Pennsylvania. It’s no secret that the main reason I want — no need — to stop there is so that I can wake up early and run the familiar loop, the one that takes me through cow pastures and across the ridge. I need this vista, which hasn’t changed at all in years. From the top, I can see mist over the valley, and I can see the top of the hills on the other side. This is sort of God’s perspective, isn’t it? He sees from above, the whole. I generally am only able to see from below, in small parts, the fragments of this life. Further down this asphalt road is a town whose name is Gray. The town fulfills her name — she’s weathered, worn, and sad. But the road there winds around farms, and I once wore out many pairs of running shoes on them. I saw a calf fall bloody from its mother’s body beside that road, and my time pounding the pavement there was not unlike such birthing. Once a grizzled farmer slowed his truck enough to ask me, “Are you running away from something or to something?” Yes. Both. I couldn’t have told him then — it took years to see it, but I was running from the girl I thought I was supposed to be, straight into the skin and bones of the person God had actually created me to become. Not all of my places feel pleasant. There is a long lane that cinches my chest when I drive it, compressing the air inside until I have to fight to breathe. It’s lovely and leads to a picturesque spot, but it’s the scene of some painful memories, and I can’t escape them when I arrive. That pain is slowly being redeemed, and it shapes me as tenderly as the sweeter places do. So when I can’t sleep, or can’t remember truth, I picture myself in these places that make me. I close my eyes to walk the road in Linden that winds towards my parents’ farm, around curves that show the promise of something to come but don’t give up the secrets of what lies ahead. I smell the morning heat baking the wild berries nearby, and I look for signs of bears in the underbrush. I remember that God is with me, and that He made the places that shape the spaces inside of me. He sees all of this as a whole while I am still understanding the parts and how they join together. I’m so grateful to have spots on a map I can touch and say, “Here I am, and this is me here, too, and a little bit of there as well.” And when I can’t leave home to return to these dear places, I can still sneak up into my boys’ tree house and dream. Allison Gaskins writes beneath a window in a snug closet of her Virginia home. She is the author of several books, mom to five, and wife of a patient man. She works for Mantle Music and Art House North when she is not busy staring out the window, gathering words.